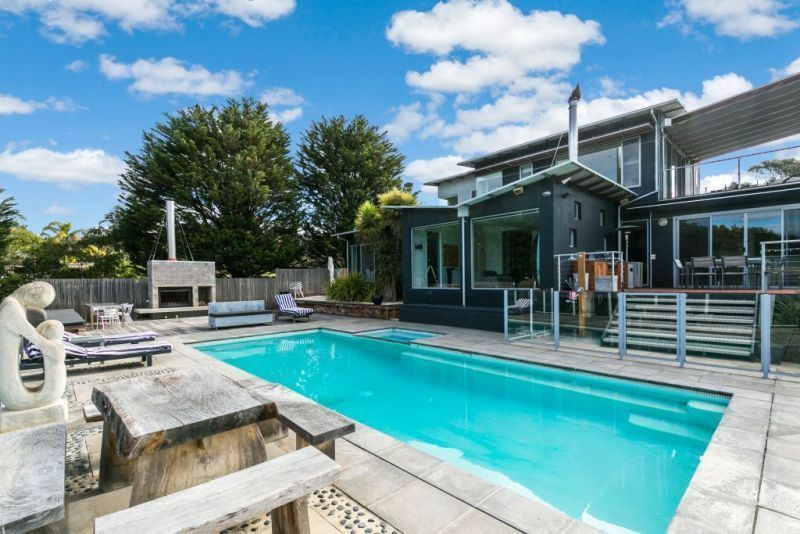 This 5 bedroom home has been well designed with holiday features in mind and is only a short walk from the beach cliff top walks and short stroll to the Jan Juc town centre and the iconic Bells Beach is a short 5 minute drive away. You enter the house to find yourself in the generous lounge/dining/kitchen/meals area. Complete with log fire it's the perfect place to curl up and read a book on a cold day. This living room is complete with LCD TV & DVD. The large doors open up onto a large alfresco dining area complete with BBQ pool and open fireplace. Also on this level there is a Master Bedroom with Ensuite (Queen Bed) powder room and second bedroom. Upstairs there are three more bedrooms, main bathroom and second living room complete with LCD TV, private balcony with views to Port Phillip Heads. The third bedroom has a tri bunk bed, fourth bedroom tri bunk bed and the fifth bedroom another king bed. This property has ducted central heating and cooling downstairs only. For a stunning planned holiday this home well worth a visit.